صفری سنجانی, علی اکبر, باقری, رقیه. (1395). پیامد هوموسی شدن کاه گندم و توانایی ریزجانداران آن بر جذب زیستی سرب از یک آب آلوده. مجله آب و فاضلاب, 27(4), 45-55. علی اکبر صفری سنجانی; رقیه باقری. "پیامد هوموسی شدن کاه گندم و توانایی ریزجانداران آن بر جذب زیستی سرب از یک آب آلوده". مجله آب و فاضلاب, 27, 4, 1395, 45-55. صفری سنجانی, علی اکبر, باقری, رقیه. (1395). 'پیامد هوموسی شدن کاه گندم و توانایی ریزجانداران آن بر جذب زیستی سرب از یک آب آلوده', مجله آب و فاضلاب, 27(4), pp. 45-55. صفری سنجانی, علی اکبر, باقری, رقیه. پیامد هوموسی شدن کاه گندم و توانایی ریزجانداران آن بر جذب زیستی سرب از یک آب آلوده. مجله آب و فاضلاب, 1395; 27(4): 45-55. یکی از روش‌هایی که برای جداسازی فلزهای سنگین از زیستگاه‌های آبی استفاده می‌شود، جذب زیستی است. هدف این پژوهش، ارزیابی پیامد هوموسی شدن و توانایی ریزجانداران کاه ‌گندم در جذب و نگهداری سرب از محیط‌های آبی بود. برای دستیابی به این هدف، کاه گندم در دمای آزمایشگاه و رطوبت 70 درصد برای هوموسی شدن نگهداری شد و در هر یک از روزهای 1، 20 و 60 ، نمونه‌هایی از آن برداشت شد و برخی از ویژگی‌های فیزیکی، شیمیایی و بیولوژیکی آن‌ها بررسی شد. سپس دو زیر نمونه سترون و ناسترون از آن آماده شد و همدماهای جذب سرب بر هر یک از مانده‌های نمونه‌برداری شده سترون و ناسترون با کاربرد غلظت‌های گوناگونی از سرب در محلول 001/0 نرمال نیترات سدیم در pH برابر 6 بررسی شد. از میان همدماهای جذب لانگمیر، فروندلیچ و تمکین تنها مدل تمکین بر داده‌های جذب سرب خوب برازش نشد. بیشترین گنجایش جذب سرب 36/63 و 41/108 میلی‌گرم بر گرم به‌ترتیب در نمونه کاه گندم تازه- سترون شده و کاه گندم هوموسی شده ناسترون براورد شد. 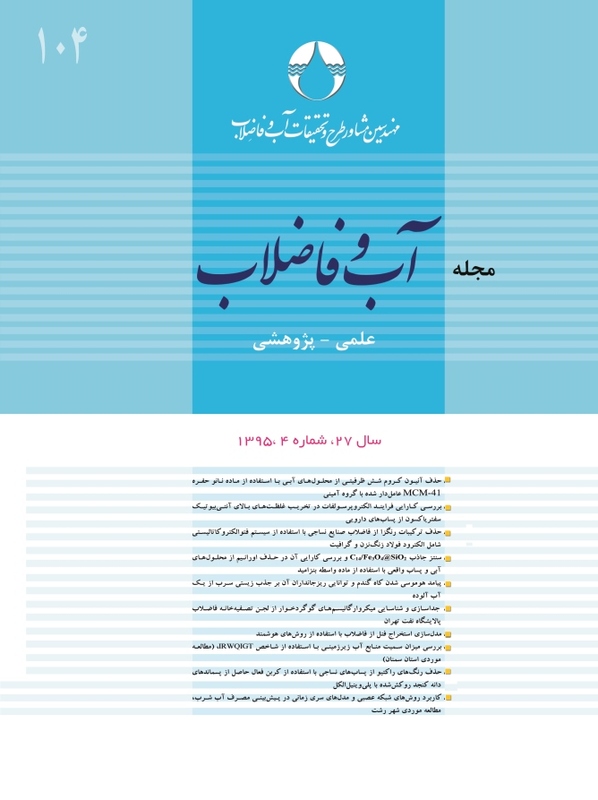 درصد جذب سرب در بالاترین غلظت به‌کار رفته آن در نمونه‌های ناسترون کاه گندم در روزهای انکوباسیون 1، 20 و 60 به‌ترتیب برابر 21/32، 43 و 96/60 درصد بود. با پیشرفت هوموسی شدن کاه گندم ضریب‌های Kl ، n و Kf نیز افزایش یافت. همه فراسنجه‌های جذب سرب در کاه گندم ناسترون به اندازه چشمگیری بیشتر از نمونه‌های سترون شده بود و این نشان می‌دهد که ریزجانداران کاه توانایی بالایی در جذب سرب از محیط آبی دارند. Biosorption is one of the methods used for the separation of heavy metals from aquatic environments. The objective of this study was to investigate wheat straw humification and the capability of its microorganisms for the biosorption of Pb from aqueous solutions. Wheat straw (3 solution (0.001 N) with different Pb concentrations at pH 6. Among the Langmuir, Freundlich, and Temkine models, only the latter failed to fit Pb adsorption data. The highest sorption capacities (qmax) were obtained by the Langmuir model for the humified and unsterile sample (108.41 mg g‒1) and the lowest was obtained for the fresh and sterile sample (63.36 mg g‒1). Lead adsorption increased significantly with incubation time and its highest values were recorded with unsterile straw samples taken on days 1, 20, and 60 which were equal to 32.21, 43, and 60.96%, respectively, for the highest Pb concentration. The Langmuir constant (Kl) and Freundlich constants (Kf and n) were significantly higher for the more humified wheat straw samples compared to those for raw straw. All the adsorption parameters recorded higher values with the unsterile wheat straw compared to the sterile one, indicating the ability of the microorganisms to adsorb Pb from aqueous solutions. 2. Wu, C.H., and Zhang, L. (2010) “Heavy metal concentrations and their possible sources in paddy soils of a modern agricultural zone southeastern China.” Environmental Earth Science, 60, 45-56. 3. Varnam, A.H., and Malcolm, G.E. (2000). Environmental microbiology, ASM Press, Washington D.C., USA. 4. Puranik, P.R., and Paknikar, K.M. (1997). “Biosorption of lead and zinc from solutions using Streptoverticillium cinnamoneum waste biomass.” Journal of Biotechnology, 55, 113-124. 5. Volesky, B. (1990). Biosorption of heavy metals, CRC press, Boca Raton, F.L. P. 396. 6. Deng, L., Su, Y., Su, H., Wang, X., and Zhu, X. (2007) “Sorption and desorption of lead (II) from wastewater by green algae Cladophora fascicularis.” Journal of Hazardous Materials, 143(1-2), 220-225. 7. Raungsomboon, S., Chidthaisong, A., Bunnag, B., Inthorn, D., and Harvey, N.W. (2008). “Removal of lead (Pb2+) by the cyanobacterium gloeocapsa sp.” Bioresource Technology, 99, 5650-5658. 8. Tereshina, V.M., Marin, A.P., and Kasyakov, V.N. (1999). “Different metal sorption capacities of cell wall polysaccharides of Aspergillus niger.” Applied Biochemistry Microbiology, 35, 389-392. 9. Kumar, U., and Bandypadhyay, M. (2007) “Sorption of cadmium from aqueous solution using pretreated rice husk.” Bioresource Technology, 97, 104-109. 10. Babarinde, N.A.A., Babalola, J.O., and Sanni, R.A. (2006) ”Biosorption of lead ions from aqueous solution by maize leaf.” International Journal of Physical Sciences, 1 (1), 23- 26. 11. Abdel-Ghani, N.T., Hefny M., and El- Chaghaby, G.A.F. (2007) ”Removal of lead from aqueous solution using low cost abundantly available adsorbent.” International Journal of Environmental Science and Technology, 4(1), 67- 73. 12. Feng, Q., Lin, Q., Gong, F., Sugita, S., and Shoya, M. (2004). “Adsorption of lead and mercury by rice husk ash.” Journal of Colloid and Interface Science, 278, 1-8. 14. Wong, K.K., Lee, C.K., Low, K.S., and Haron, M.J. (2003). “Removal of Cu and Pb by tartaric acid modified rice husk from aqueous solution.” Chemosphere, 50, 23-28. 15. Han, R., Zhang, J., Zou, W., Shi, J., and Liu, H. (2005) “Equilibrium biosorption isotherm for lead ion on chaff.” Journal of Hazardous Material, 125, 266- 271. 16. Farajzade, N. A., and Monji, A. B. (2004). “Adsorption characteristics of wheat barn towards heavy metal cation.” Separation and Purification Technology, 38, 197- 207. 17. Periasamy, K., and Namasivayama, C. (1996) “Adsorption of Pb (II) by peanut hull carbon from aqueous solution.” Separation Science and Technology, 30 (10), 2223- 2237. 18. Nick Azar, M., and Noorbakhsh, N. (2006) “Elimination of heavy metals (Cr (VI) Pb (II) Cd (II) from aqueous solutions by activated carbon produced from agricultural waste (rice bran wheat bran and straw).” Journal of Environmental Science and Technology, 8(1), 34-43 (In persian). 21. Shokohi, R., Ehsani, H.R., and Tarlaniazar, M. (2014). “Removal of lead and cadmium by coral limestone granules of aquatic solutions.” Journal of Environmental Science and Technology, 16(1), 109-121. 22. Jafari, N., and Ahmadi Asbchin, S. (2014) “Adsorption of cadmium and lead ions from aqueous solution by brown algae Cystoseira indica.” Journal of Plant Researches (Iranian Journal of Biology), 27(1), 23-31. (In Persian). 23. Jafari, N. (2014). “Comparison uptake of cadmium (II) from aqueous solution onto algae brown fucus serratus and Cystoseira indica.” Journal of Water and Wastewater, Vol. 25 No. 6 (94), 30-35. (In Persian). 24. Puranik, P.R., and Paknikar, K.M. (1997). “Biosorption of lead and zinc from solutions using Streptoverticillium cinnamoneum waste biomass.” Journal of Biotechnology, 55, 113-124. 29. Thomas, G.W. (1996). “Soil pH and soil activity.” In, Klute (Ed)., Methods of soil analysis Part3., chemical methods, pp., 475-490. Widision., Wisconsin USA. 30. Roades, J.D. (1990). “Salinity electrical conductivity and total dissolves solids.” In: Methods of soil analysis, part3 chemical methods, pp, 417-436. Medision., Wisconsin USA. 31. Nelson, D.W., and Somers, L.E. (1996). “Total carbon, organic carbon and organic matter.” In, Klute (Ed)., Methods of soil analysis part3., chemical methods, PP., 691-1010, Madision Wisconsin, USA. 32. Matthiessen, M.K., Larney, F.J., Selinger, L.B., and Olson, A.F. (2005) “Influence of loss-on ignition temperature and heating time on ash content of compost and manure.” Soil Science and Plant Analysis, 36, 2561-2573. 33. Peperzak, P., Caldwell, A., G., Huniziker, R., and Black, C.A. (1959) “Phosphorus fraction in manures.” Soil Science, 87, 293-302. 34. Alef, K., and Nannipieri, P. (1995). Methods in applied soil microbiology and biochemistry, Academic Press Inc. USA. 35. Isermeyer, H. (1952) “Eine einfache method zur bestmmung der bodenatmung und der carbonate im boden.” Pflanzenernah Bodenk, 55, 26-38. 36. Vance, E.D., Brookes, P.C., and Jenkinson, D.S. (1987). “An extraction method for measuring soil microbial biomass C.” Soil Biology and Biochemistry, 19, 703-707. 37. Nassar, M.M. (1997) “The kinetics of basic dyes removal using palm fruit bunch.” Adsorption Science Technology, 15(8), 609-617. 38. Saviozzi, A., Levi-Minzi, R., Riffaldi, R., and Benetti, A. (1992). “Evaluating garbage compost.” BioCycle, 33, 72-75. 39. Bernal, M.P., Alburquerque, J.A., and Moral, R. (2009). “Composting of animal manures and chemical criteria for compost maturity assessment, A review.” Bioresource Technology, 100, 5444-5453. 40. Moore, J.C., McCann, K., and Ruiter, P.C. (2005) “Modelling trophic pathways nutrient cycling and dynamic stability in soils.” Pedobiologia, 49, 499-510. 41. Janzen, H.H., and McGinn, S.M. (1991) “Volatile loss of nitrogen during decomposition of legume green manure.” Soil Biology Biochemistry, 23, 291-297. 42. Hameed, B.H. (2009). “Evaluation of papaya seeds as a novel non-conventional low-cost adsorbent for removal of methylene blue.” Journal of Hazardous Materials, 162, 939-944. 43. Sciban, M., Radetic, B., Kevresan, Z., and Klasnja, M. (2007) “Adsorption of heavy metals from electroplating wastewater by wood sawdust.” Bioresource Technology, 98, 402-409. 44. Ozer, A., and Pirinc, C.I.H.B. (2006). “The adsorption of Cd(II) ions on sulfuric acid-treated wheat bran.” Journal of Hazardous Materials,137, 849-855. 45. Ozer, A., Ozer, D., and Ozer, A. (2004) “The adsorption of copper(II) ions on to dehydrated wheat bran (DWB), determination of the equilibrium and thermodynamic parameters.” Process Biochemistry, 39, 2183-2191. 46. Sciban, M., Radetic, B., Kevresan, Z., and Klasnja, M. (2007) “Adsorption of heavy metals from electroplating wastewater by wood sawdust.” Bioresource Technology, 98, 402-409. 47. Saglam, A.,Yacinkaya, Y., Denizli, A., Arica, M.Y., Genc, O., and Bektas, S. (2002). “Biosorption of mercury by carboxycellulose and immobilized Phanerochaete chrysosporium.” Microchemical Journal, 71, 73-81. 48. Jung Ho, S., Jong Won, Y., and Seog, D.K. (1998). “Comparison of Pb2+ accumulation characteristics between live and dead cells of Saccharomyces cerevisiae and Aureobasidium pullulans.” Biotechnology Letters, 20, 247-251. 49. Macaskie, L.E., and Dean, A.C.R. (1989). “Microbiol metabolism, desolublilisation and deposition of heavy metal: Metal uptake by immobilized cells and application to detoxification of liquid wastes.” In: Mizrahi A., (Ed,) Advances in biotechnology processes, biological waste treatment, New York, 201.